If you are looking to take your e-commerce site and the product images on your site from amateur to professional, then you need to be going the extra mile. Simple and understated details like using realistic Shadows can really take your product photos to the next level. If you take the time and effort on your product images and retouching process, It will directly translate into your customers feeling more in tune with your brand and willing to spend money with you. You don’t need a huge budget or a big team to create excellent product photos, it just takes patience and an attention to detail to make your images pop. 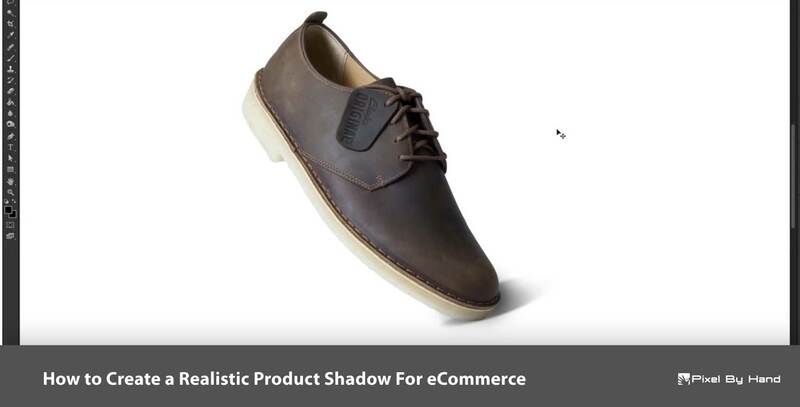 Using Adobe Photoshop we are looking to add a realistic shadow to product image – we will be using a shoe to illustrate the method. You will be able to apply these methods to virtually any product you wish. First thing’s first let’s open Adobe Photoshop and load the image we wish to add the shadow too. The shoe is on a white background and it doesn’t have any shadow at all, to begin with. As you can see the image looks a little bit flat and also not very realistic. Start by clicking the layers palette on the right-hand toolbar. If you want you can change the names of any of your layers, you can do so by clicking on them and typing in the new name. We are going to create a new layer between the background and shoe layers. We are going to click create a new layer in the bottom right-hand corner (Layer 1). Click on the colour picker on the left-hand side, then choose black as our foreground colour. Click the brush size button on the top toolbar. Then adjust the hardness so we have a nice feathered brush. Bring it write down to 0%. Next, we are going to select the ellipse marquee tool on the left-hand toolbar. We need to draw a shape roughly the same shape and size as this. We now position the shape to reflect the angle of the shadow. It does not need to be that accurate at this stage. We need to adjust the opacity bringing it down slightly. This will be adjusted for the later on. You can also change the layer name from Layer 1 to shadow if you wish. Click add a layer mask in the bottom right-hand corner. Make sure black colour is selected and also the mask is selected in the shadow layer. We can now gently brush into the ellipse shape. The top right-hand Edge the ellipse is going to be a lot lighter than the bottom end closer to the shoe. As we find in all Shadows, using the mass gives a lot of flexibility in adding and removing the black or white colours. We want to end up with something that looks roughly like this. The layer selected and not the mask for the shadow layer. We are going to click filter at the top of the screen, down to Blur, then select Gaussian blur. We are now going to apply the minimum amount of Blur that we require. This is going to be anything around close to the shoe. As you move away from the shoe it is going to get fainter but also more blurred. You can bring it up or down a bit more if you need to. Adjust as you see fit. Now it’s simply a case of adding and removing the Blur, add/remove dark or light colour to the shadow mask and adjusting the opacity until we are happy how everything looks. You can keep adjusting the settings until you find something that looks completely believable. So that’s the basic principles behind adding a shadow to a product image. It may take a bit of practice until you are comfortable creating Shadows. But once you have mastered it you will be able to create a number of Shadows very quickly. There you go! What’s your experience in trying to create shadows for your product images? We’re excited to know! Let us know in the comments section below.